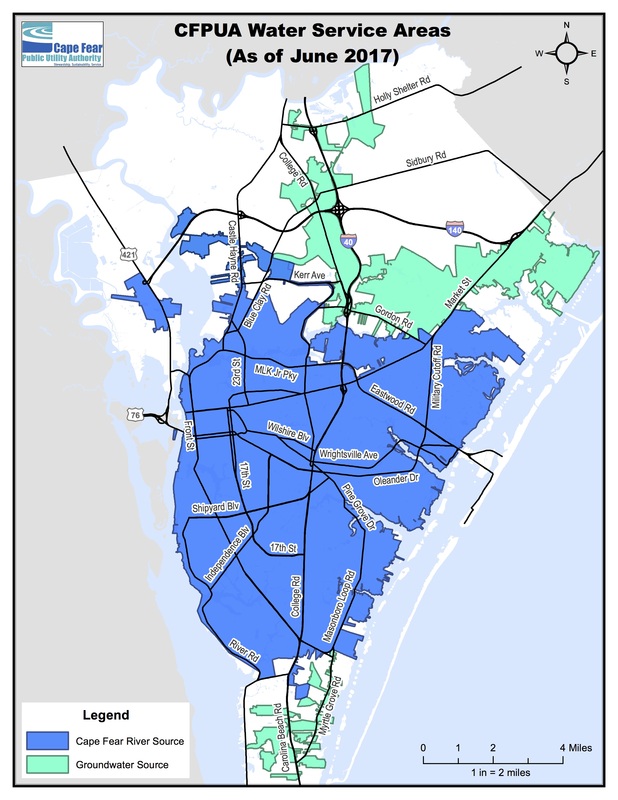 Areas shaded in blue receive water from the Cape Fear River, which is treated by the Sweeney plant in Wilmington. A new contaminant, GenX, has been found in drinking water supplies. The Cape Fear Public Utility Authority is accusing Chemours/DuPont of “willful and wanton” conduct over the company’s secret discharge of GenX and other pollutants into the Cape Fear River. Those chemical compounds wound up in the drinking water of several communities near the Fayetteville Works plant and farther downstream, including Wilmington. The allegation was one of several in a complaint filed this afternoon in federal court against the company. The utility is asking the court for a jury trial, which given widespread concern about the contamination, Chemours is likely to oppose. The filing contains several points regarding what DuPont knew concerning the health effects of GenX and similar compounds like C8, which has been linked to cancer. The company had begun studying the health effects of GenX no later than 1963, according to the court documents. In addition, as part of their premanufacture notices for GenX under the Toxic Substances Control Act (“TSCA”), DuPont submitted health and safety data to the EPA. Those submissions — redacted to omit alleged confidential business information—show that GenX has been associated with various health effects in laboratory animals consistent with the effects of other perfluoronated compounds: harm to the liver, kidney, pancreas, testicles and immune system. Those contentions later were proved false in the class-action suit. The litigation, representing 80,000 people, revealed that DuPont had discharged C8 into the drinking water supply in Parkersburg, W.V. and in communities along the Ohio River. There were statistically higher incidents of cancer among people who had been exposed to the compound. Ten years ago, DuPont told state environmental officials that all C8 process wastewater was to be captured and disposed of off-site. But monitoring reports have documented discharges and/or releases of C8 to the Cape Fear River through at least March 2017. In fact, a series of investigations by the EPA and state environmental officials from 2003–2014 show that there had been several releases of C8 into the Cape Fear. Soil and groundwater throughout the facility was contaminated, some of it possibly via the air. And from 1979–1990, unlined lagoons were used to store biosludge from wastewater from throughout the facility. That contaminated sludge was then discharged to the Cape Fear River. Cape Fear utility is asking for both compensatory — money for injury and loss — and punitive damages, which would be added to the judgment if the court finds the company acted with malice or neglect. The complaint was filed in US District Court, Eastern District of North Carolina. This lawsuit is pursuant to the Clean Water Act and RCRA after CFPUA gave Chemours notice 60 days ago as required under the Clean Water Act and RCRA. I know you loath this – having to admit your cherished Cooper isn’t doing his job – but that is what this case is about. It clearly states in the complaint that critical to this action will be whether the sweetheart deal signed between Chemours and Cooper will block this action. Cooper and his Keystone cops have bungled this from the very beginning (although I am confident that the professional staff was not to blame). Remember – first the Gov wrote to Pruitt saying NC couldn’t do anything until EPA passed standards for GenX – that was entirely political and false as pointed out so delicately by George House – then Sec Regan said Chemours was entirely blameless – false – then DEQ said Chemours disclosed everything from the beginning of time thereby shielding the company from enforcement – false – then Cooper said the discharges were condoned by an EPA consent decree that only covered TSCA – false – then all of that was reversed in DEQ’s own complaint. Finally, at 5:30 one Friday afternoon, DEQ signs the sweetheart deal with Chemours that appears to let them out of citizen suits under Federal law. Stunning, really. I continue to ask whether Chemours and Cooper are somehow cozy – since from the beginning his administration has sought to shield them. Please do the same investigation here in the Netherlands! Because they (the government )are lying in our face !